Recently the Collections department has been sorting through a collection of archival material and artifacts belonging to Franz Wilhelmsen. Most people know him as the father of Whistler, the man responsible for transforming it into best ski resort in North America. With such an amazing life accomplishment came a plethora of awards and honours inside and outside the Whistler community. 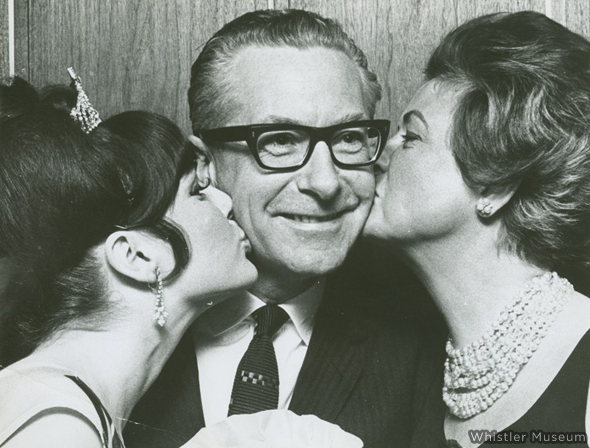 In 1966 he was named Man of the Year by the Greater Vancouver Visitors and Convention Bureau. In 1981 Franz received the Jim Marshall award which is given to a member of the Canada West Ski Area operators who has contributed the greatest effort in the public enhancement and enjoyment of the sport of skiing in Western Canada. In 1983, Franz was named a Freeman of Whistler. A title not often bestowed on inhabitants of the area, joining other members such as Myrtle Philip. In 1984, Franz received the Canadian Tourism Medallion for his development of Whistler Mountain and the successful bid to bring the World Cup Downhill competition to Whistler. Franz was nominated in both 1991 and 1998 for the Order of British Columbia but was not chosen as a recipient. 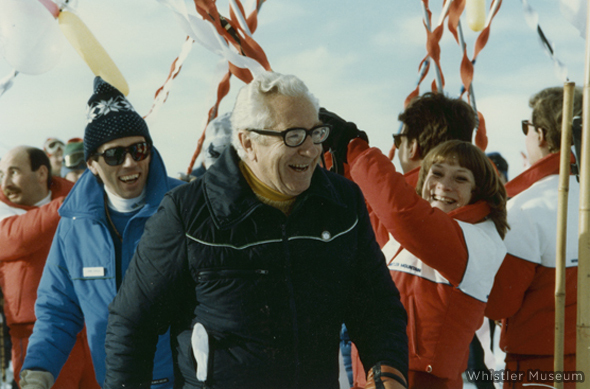 In 1996, Franz was part of the class inducted into the Canadian Ski Hall of Fame. Then in 1998 he was also inducted to the BC Sports Hall of Fame, through which he received the W.A.C Bennett Award, an award recognizing a person who has made significant contributions to sport in British Columbia. As if all this weren’t enough, in 1998, Whistler honoured its father by naming his favourite ski run “Franz’ Run”. 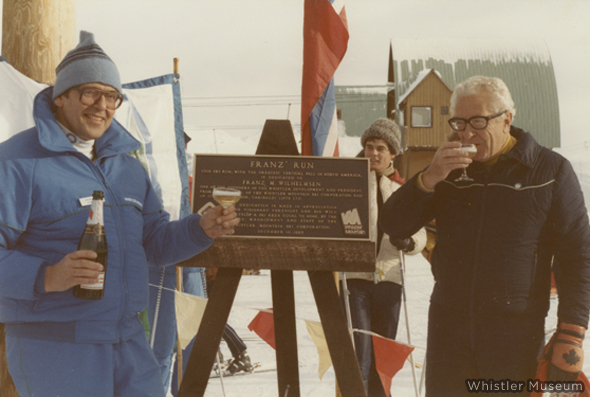 Franz takes a drink during the ceremonial naming of his ski run. Franz’ life accomplishments and contributions to Canada and the province British Columbia are immense and the recognition of his very successful endeavours are all very well deserved. But the truly lasting legacy of Franz’ life, the one that is and will always be visible to all peoples living and visiting the Whistler area, is the mountain that he saw such great promise in. It is this lasting legacy that will win him the gratitude of generations to come. It was a good day to be the Father of Whistler! This entry was posted in From the Archives and tagged Awards, Father of Whistler, Franz Wilhelmsen, Franz' Run, Man of the Year, Whistler Mountain, Whistler Museum. Bookmark the permalink.